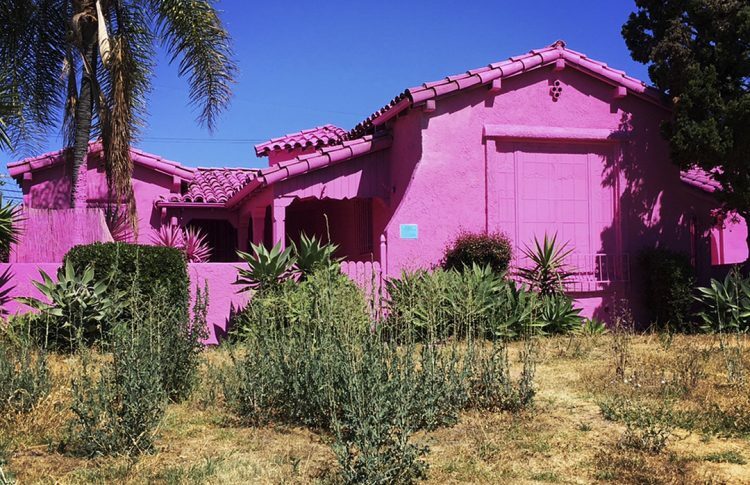 If you’re looking for the perfect place to take an Instagram-worthy photo in Los Angeles, these three completely pink houses in the city’s Pico neighborhood are bound to catch people’s attention. The question “what would Barbie’s house look like in real life?” has just been answered courtesy of Los Angeles artist Matty Mo, a.k.a @themostfamousartist. He was asked by M-Rad Architecture, a local housing developer, to create some buzz about their new project, a a 45-unit apartment complex to be built on the lot currently occupied by three abandoned houses. Mo and his company, The Mural Agency, specialize in “‘Instagrammable’ experiences as a service for brand partners worldwide,” and in this particular case, they decided to paint the three houses completely pink, before they are demolished. @themostfamousartist went all out on this project, covering every inch of the properties in a sea of pink, including the roofs, driveways and even the plant leaves. But while the temporary art piece had the desired effect, attracting “thousands of people”, it also managed to upset some of the neighbors, who consider it an eye-sore that doesn’t do their neighborhood justice. M-Rad Architecture said that drawing attention to its new apartment complex was not the only motivation for letting Matty Mo paint the three properties pink. It also wanted to start a dialogue with the neighbors about how long it takes to get city approvals for residential buildings, and also to “activate” the three abandoned houses so that squatters don’t move in before the demolition permits are released by the authorities.